Disclosure: This post is sponsored by KORXX. All opinions are my own. We love our KORXX cork building blocks. They are right there in the bin of blocks and have quickly become a favorite go-to toy. 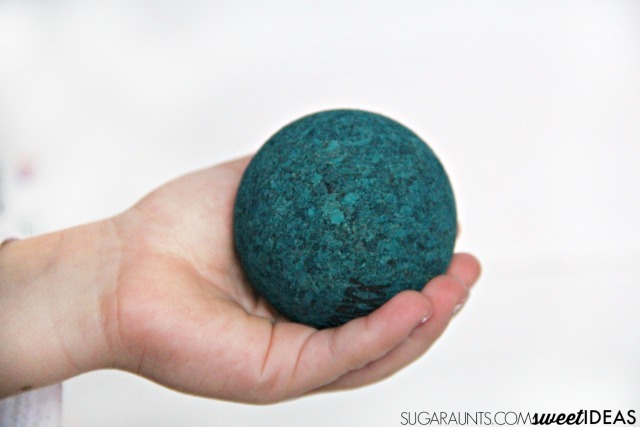 I love them for all of the open-ended play ideas that my kids have been creating with them. 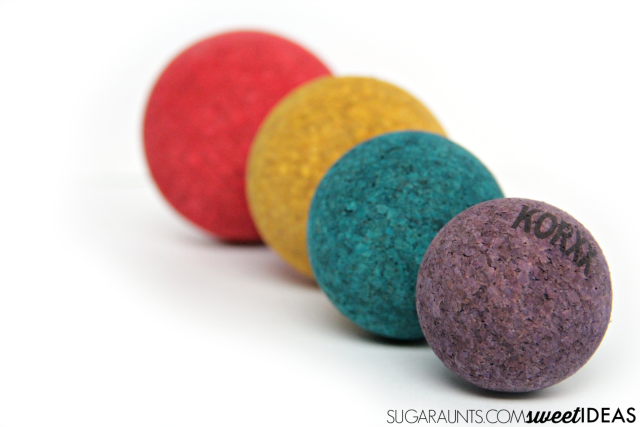 Using them to boost developmental skills through play is super easy, too. (See how we used them to work on visual motor integration development recently.) 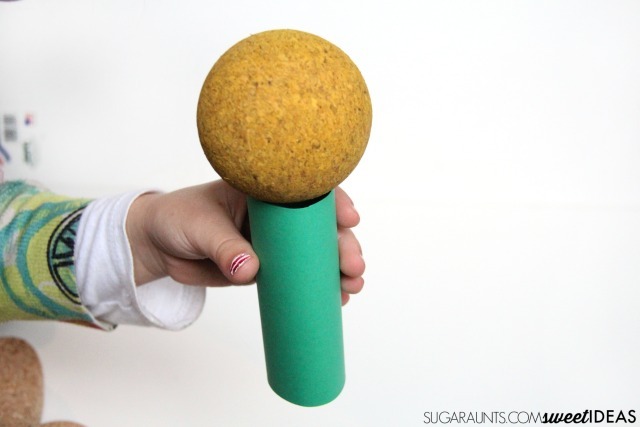 When I saw my kids using the Cork Sphere Stacking Tower to make some pretend ice cream cones, I was inspired to encourage fine motor skills like cylindrical and spherical grasp development. If you are looking for creative ways to encourage development of grasp, then read on! 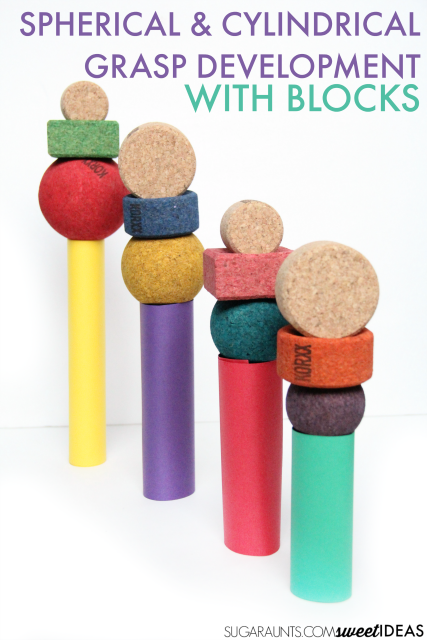 The spheres in the Limbo var C KORXX cork building blocks set are perfect for helping kids develop fine motor skills. Building and stacking with regular blocks is an exercise in fine motor development. However, typical building blocks do not provide the unique grasp development of the cylindrical grasp of the hand. A cylindrical grasp is one in which the whole hand is in contact with an object, and curved with thumb opposition. A common term for this grasp is gross grasp. You can find more information on gross grasp development and strengthening with objects that we've done in the past. A cylindrical grasp requires use and strength of the extrinsic muscles and intrinsic muscles of the hand in order to flex the fingers around curved objects. The thumb is positioned in flexion and abduction. A cylindrical grasp is needed in order to hold a broom handle, baseball bat, and ice cream cone. Typically, the cylindrical grasp develops early in childhood, beginning with the palmer grasp at around 12 months of age. This grasp is precursor to fine motor development and is an early pre-writing grasp. This grasp pattern evolves into the cylindrical grasp with thumb abduction and fluctuations in finger abduction. The KORXX cork building block set that we have has small cylindar shapes and we were able to encourage promotion of this grasp pattern by using them AND by creating paper tubes. This is a perfect extension of my kids' imagination as we used them to make colorful ice cream cones with the KORXX spheres. Holding the paper tubes allows further development of the cylindrical grasp from a power grip to one of precision. In order to hold the paper tube, one can not squeeze with all of their strength. Otherwise, the paper will crush in their hands. The same is true when holding a cake-type ice cream cone or a paper cup. If precision of the cylindrical grasp is not developed, the cone or cup will crush in a child's hands. NOTE: There is a difference between holding a cake type ice cream cone which is a tube shape and a sugar ice cream cone which would be conical in shape. These are different grasp patterns. We used the paper tubes to stack, build, and create lots of ice cream cones of various sizes. To make the paper cones, simply use colored cardstock and tape. Cut the cardstock into different sizes and then roll it into a tube. We found that packing tape worked well to maintain the shape of the tube. A spherical grasp is one in which the hand curves to hold a round or sphere-shaped object. The intrinsic muscles of the hands play a big part in this grasp. In order for the hand to curve, the metacarpal phalangeal joints need to abduct. Involved in this action are the interossei muscles and the hypothenar eminence. The interossei include the palmer interossei and the dorsal interossei. These allow the fingers to abduct and adduct in order to grasp smaller and larger sphere shaped objects. The hypothenar eminence includes three intrinsic muscles that allows the pinkie side of the hand to flex, rotate to oppose the thumb, and create the bulk of the pinkie side of the palm when curving around shapes like spheres. Spherical grasp develops beginning at around 18 months. Smaller objects require a smaller curved palm with opposition and larger objects such as an apple require increased adduction of the metacarpal phalangeal joints. 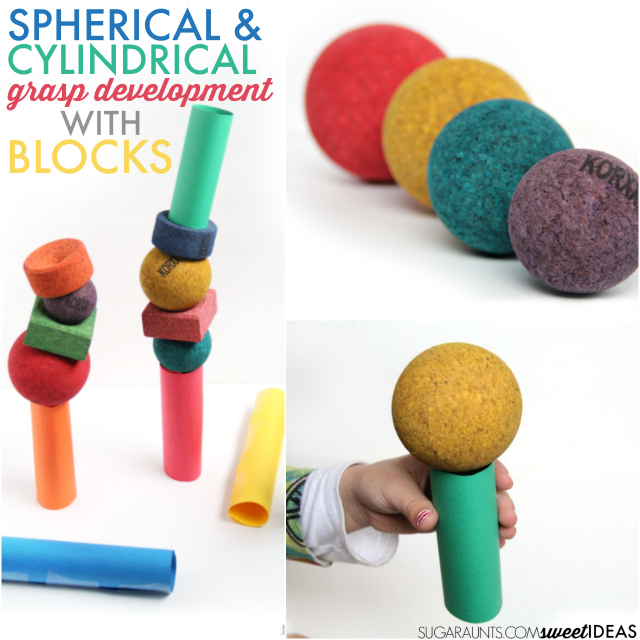 We used our KORXX cork building blocks to practice various grasp and release of the spheres. This block set is unique in it's varying sphere sizes. Placing the spheres on the paper cones allowed for precision of this grasp pattern. How fun is this building activity. The spheres and cups of the Limbo var C KORXX cork building set inspires stacking to new heights with balance. Building and creaating towers of various size is such a powerful way to encourage precision, grasp, and control of small motor movements of the hands. KORXX building blocks are made from natural cork harvested without harming the trees. They are soft and silent, stable and safe, and light cork blocks. KORXX's blocks are a natural material free of any harmful contaminants. The cork material provides excellent stability without slippage. Unlike typical cork used for other products, it is also safe for even the smallest of children. KORXX pressed Cork contains no harmful substances (phthalates, dioxins, formaldehyde) and has no other sensory emissions. The product adheres to the guidelines for children's toys (under 3 years) and the harmonized standard DIN EN 71. 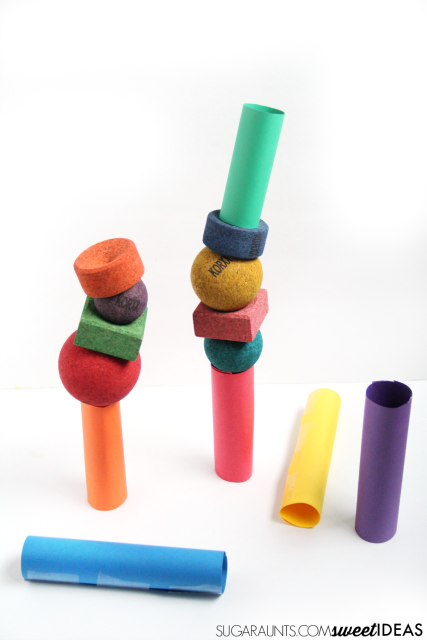 How would you use KORXX cork building blocks to address cylindrical grasp and spherical grasp development?